Click here to view these and other meat and livestock supply chain jobs currently listed on Jobs Central. AUSTRALIA’S agricultural workforce is growing, getting younger and engaging more females, according to an analysis released this week by the Australian Bureau of Agricultural and Resource Economics Sciences. The ABARES Insights report compared data from the 2011 and 2016 Australian Bureau of Statistics Census of Population and Housing. It found that overall numbers employed in ag had grown by 4 percent since 2011, to 228,372. Of those, 73pc worked full time, 32pc were female, and 24pc were under 35 years of age. About 82pc of ag sector employees lived outside a capital city. Beef cattle, sheep or grain farming dominated employment in the sector, accounting for about 46pc of all people working in agriculture. In 2016, only 23pc of agriculture industry employees earned more than $1249 a week, compared to 38pc of the broader Australian workforce – despite higher levels of full time employment. While those working in agriculture are older on average than the general workforce, the proportion of under 35 year olds has risen over the past five years. Of those young people, 30pc were women, up 2pc from 2011. The median age of agriculture industry workers was 49 years, compared to 50 in 2011. While this is older than the median age of the general Australian workforce (40 years in 2016), it indicates that the agricultural workforce overall is becoming slightly younger. 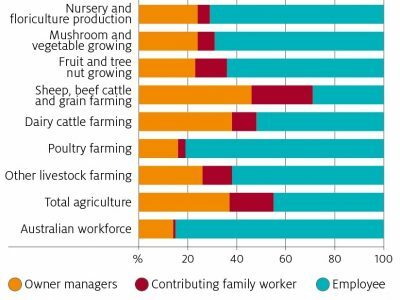 A larger proportion of the agricultural workforce were either the owner/manager of an enterprise, or worked as a contributing family member, compared with the general Australian workforce, where a larger proportion were employees. That trend was particularly apparent in the beef, sheep and grain farming category, where owner/managers or contributing family workers accounted for 70pc of all employees. Dairy farming was next highest with 44pc (see graph). The report provided a snapshot of the characteristics and diversity of people that contribute to Australian agriculture, ABARES executive director Dr Steve Hatfield-Dodds said. Around 32 percent of the agricultural workforce were women in 2016, up slightly over the five year cycle, while one percent were Indigenous, he said. The snapshot also identified an emerging trend of an increasing proportion of women and young people working in agriculture attaining non-school certificate level or higher qualifications, with the proportion rising by 7pc for women and 5pc for young people between 2011 and 2016. “These insights highlight the importance of understanding how our agricultural workforce is evolving, and being on the front foot to ensure we have the skilled and sustainable workforce needed for a growing and prosperous agricultural sector,” he said.